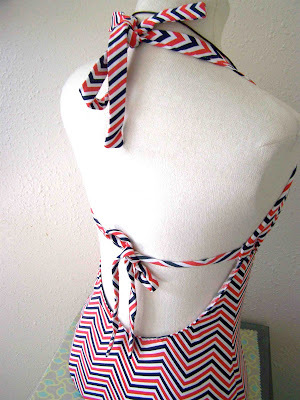 A few weeks ago I mentioned that I'd found some material for a vintage swim suit sewing pattern that I'd found while thrifting....well, I finally finished the suit, and got around to taking some pictures. I'd intended on modeling the swim suit myself, but that didn't happen. Instead you get to see my little half mannequin sport it. There were a lot of firsts with this project. 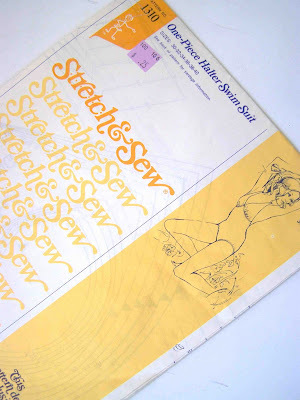 It was my first time: sewing a swim suit, transferring pattern pieces to pattern paper, lengthening pattern pieces, working with clear elastic, and serging with bulky nylon in my upper and lower loopers. Given all of the firsts, the project actually went fairly smoothly. I was going to model the suit just like the illustration...because you know, that's such a natural pose. First off, the pattern I used was Stretch & Sew One Piece Halter Swim Suit. I picked it up for a quarter, and loved the longer legs. 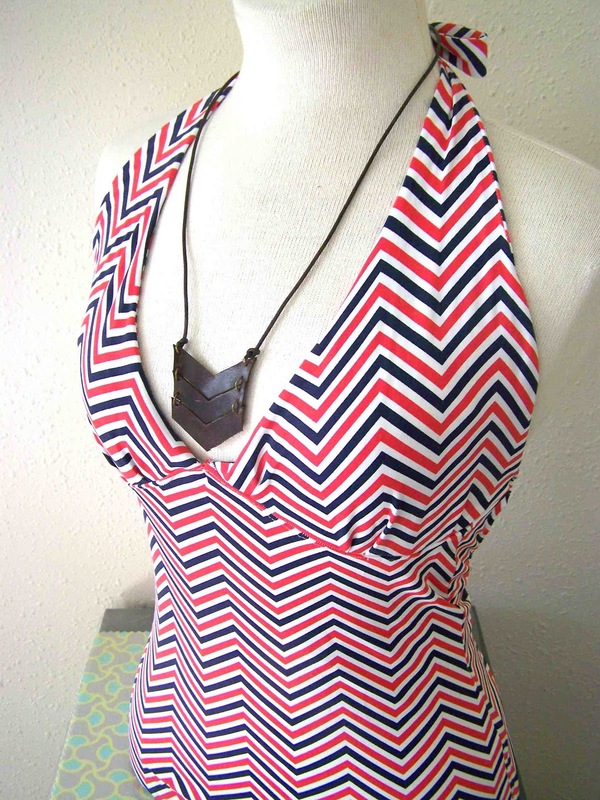 I also like a halter one piece because it gives the stomach coverage, but is still figure flattering. Vintage patterns are funny, I've found that they really are not user friendly. If you are a beginner, I wouldn't recommend starting out on a vintage pattern. The instructions can be a bit vague. I found the material on etsy, and it was a remnant piece that was being sold. The material is apparently originally from Spain, and I have absolutely no idea where you could find it, but I sure am glad that I did. Working with such a bold pattern was rather intimidating. I wanted to match up the prints the best that I could. The sewing pattern piece has one long wrapping pattern piece for the torso. 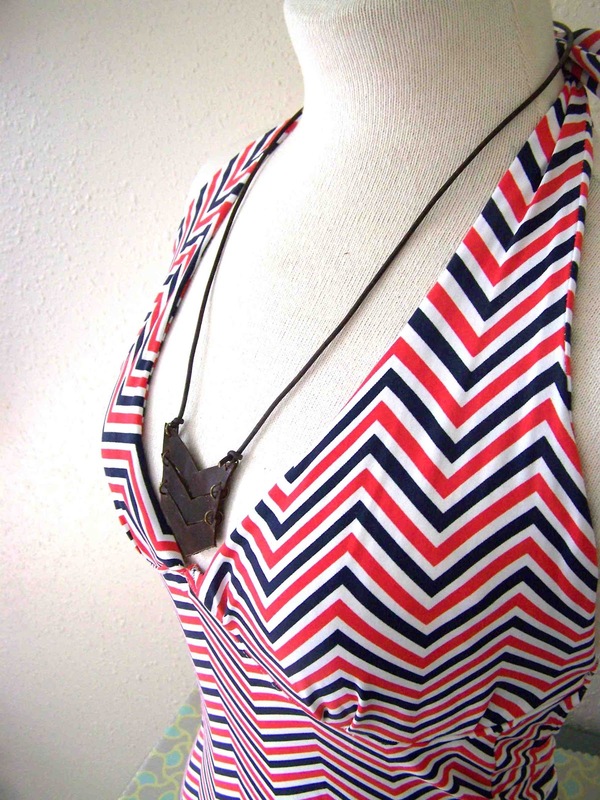 I ended up bisecting the pattern in an effort to control where the chevron pattern would match up. I was able to align it fairly well at the top of the seam, but you can see, that as the side seams go down, the print shifts. Oh well, it was a good effort. I made a few adjustments to the suit. First off, when I finished the suit, it exposed a bit more side breast than I wanted. I actually intend to swim in the suit, so falling out of it while standing still, was less then ideal. 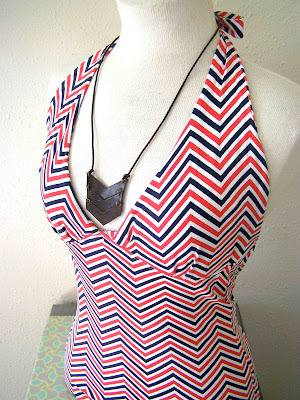 I ended up adding some additional straps at the base of the halter. It allows me to pull the sides in a bit more, and keep things where they should be. My only real frustration with this project was sewing the elastic to the legs. The measurements that were provided created a sausaging effect on my thighs. The elastic was WAY too tight. I had used a three step zig zag stitch to attach the elastic to the suit, and to secure it the wrong side of the fabric, meaning that I had to unpick two full rows on each leg, of the zig zag stitch. Not only that, but my first attempt to adjust the suit failed, and I had to do it again. All in all I was really pleased with how the material fed through my machine. The pattern was really simple to assemble. and it would have been a quick project if I hadn't had to unpick the legs. The suit is fully lined (were you worried about the white?). I used a white lining fabric that I picked up at Joann's. The materials for the suit (bra cups, fabric, lining, bulky nylon, elastic, pattern), were not inexpensive, but I ended up really liking my swim suit, and feel that it was money well spent. 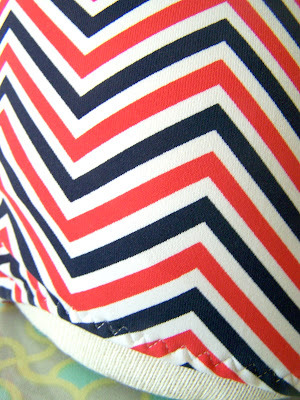 I'm most happy about the fact that I found a fabric that I really loved, and wasn't too cheap to buy it (normally I am). I love it! That is way cute! 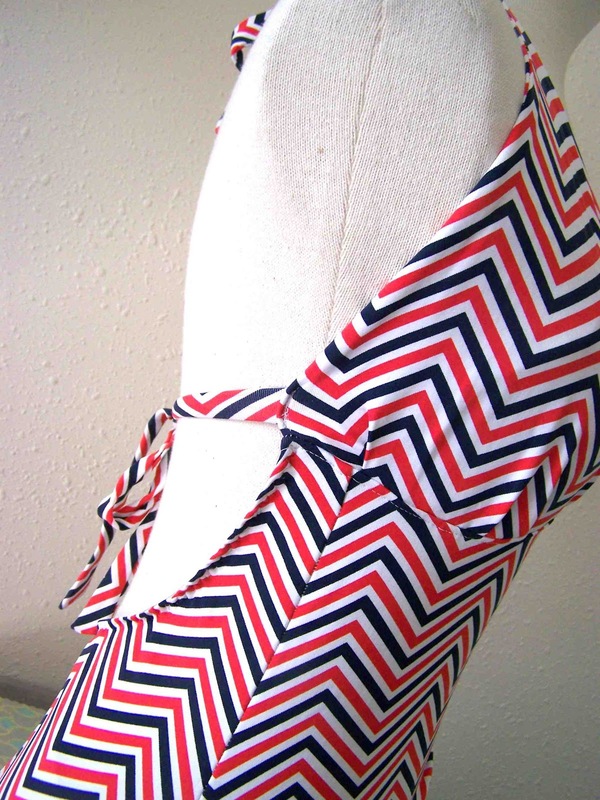 I had a disatrous experience with making a swimming suit. 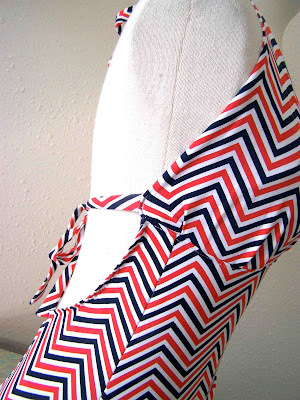 I took a beginning sewing class in college, and we were required to make a swimming suit later in the semester. I altered the pattern so that I had ample coverage on my rump. Everything was going well until I actually modeled the suit for my teacher. It was then that she told me I was supposed to have stretched the material while sewing. Why hadn't she told me that before? She told me I needed to take it all apart and re-sew it. I never did. That is a really nice looking suit! I find I'm never happy with any suit I buy, so I've been tempted to make my own. But then, I'm almost never happy with anything i make for me to wear. Ah, well. I love seeing how you make these things for yourself, its quite encouraging.